Stack & cut kaleidoscope quilts take advantage of repeating prints to produce quilts that look like kaleidoscopes. When quilt pieces are cut from a fabric's repeated print, they can be lined up in a kaleidoscope pattern, and the result is a quilt top that looks incredible complicated and sometimes even three-dimensional. Although the quilts look complicated, the actual piecing is quite simple once you know how to cut and line up your fabric properly. Select fabric appropriate for a stack & cut kaleidoscope quilt. You need to know how often a pattern repeats. To do this, find the fabric's selvage. The selvage is the end of the fabric that is more tightly woven than the rest. Look for an easily identifiable item in the fabric's pattern. Then scan the pattern up toward the other selvage until you see that item again in the pattern. Measure from the first item to the second. That distance is the fabric's repeat. Put a new blade on your rotary cutter. You'll have to cut through up to eight layers of fabric at a time, so you need a very sharp blade. Cut your fabric into squares or rectangles based on the repeat you discovered in Step 1. If you discovered that your repeat is 12 inches, you'll cut your fabric into 12-inch sections. Each section should contain the same pattern. Stack your pieces so that the pattern lines up underneath. For instance, if there is a red flower in the top right-hand corner of your top piece, there should be a red flower in the top right-hand corner of all the pieces below it. Use your rotary cutter and rotary cutting ruler to cut out the primary shape for your kaleidoscope. Triangles and diamonds work well for kaleidoscope blocks because they can easily be turned into circles. 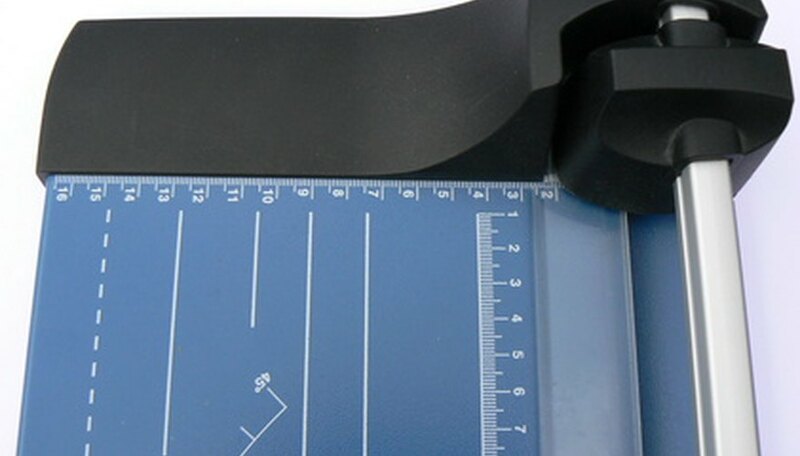 Push down hard on your rotary cutting ruler as you cut to make sure that the layers of fabric don't slip while you're cutting. You want each piece to look the same. Arrange your cut pieces into a kaleidoscope pattern on your tabletop. Kaleidoscope patterns are circular and usually have the look of concentric circles with a focal point in the middle. When you are satisfied with the design, pin right sides together and sew 1/4 inch seams with your sewing machine. Sew the kaleidoscopes into long rows. Press the seams to one side with your iron, and then sew your rows together to make a complete quilt top. Cut long strips of another fabric to make a border for your quilt. Sew the border to each side of the quilt with a 1/4 inch seam. Assemble your quilt by laying the backing fabric down first. Lay it down with the wrong side facing up. Pin or tape the backing fabric to the floor to make sure it stays stretched out while you add the other layers. Next, lay the batting down over the backing fabric. Stretch the batting out so there aren't any lumps. Lay your kaleidoscope quilt top on top with the right side facing up. Pin or tape it down to the floor. Baste your quilt by hand stitching through all three layers with long stitches, or, if you prefer, you can pin the quilt together with safety pins. If you choose the safety pin method of basting, make sure your pins are no farther apart than four inches. Machine quilt your kaleidoscope quilt by stitching in the ditch (stitching along the seam lines on your quilt top). Machine quilting works best if you have a walking foot for your sewing machine because it keeps the three layers in place and helps you to avoid puckering. If you prefer hand quilting, you can stretch the quilt out on a quilting frame and hand stitch through all three layers of your quilt. When the quilting is complete, cut strips of fabric 1 3/4" wide. Sew the strips together to create the binding for your quilt. Lay a binding strip along one of your quilt's edges. The right side of the binding should face the right side of your quilt top. Pin the binding along the edge. Use your sewing machine to sew a 1/4 inch seam all along one of the edges of your quilt. Attach the binding to the opposite side of your quilt in the same manner. Turn the quilt over and pull the binding toward the back side of the quilt. Tuck under a small hem, and hand-stitch the binding to the back of the quilt. After you have bound two opposite sides, machine stitch the binding to the front of the two remaining sides. Turn the quilt over and hand-stitch the binding to the back of the two remaining sides. Since you will likely have more scraps left over than with traditional quilting, keep your scraps and incorporate them into the border of your quilt. Be careful when cutting many layers of fabric with a rotary cutter. Go slowly, and keep your fingers out of the way.